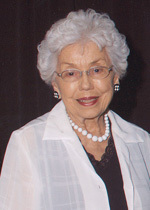 Tina Smith served as Present of the Clark County Museum from 1985 to 1987 and was in charge of the renovation of the Townsite homes that are now part of the Museum. She received an award from the Bruce Woodbury Clark County Commissioner for Outstanding Leadership, Governor Bryan named Tina to the “Honor Roll of Excellence” for her volunteerism, and she won the Elmer Anderson Award for Special Projects. She also served as a volunteer at St. Rose Dominican and is a member of their Auxiliary. Dedicated to preservation, Tina was in charge of Henderson’s part in raising funds to redecorate the Governor’s Mansion in Carson City, Nevada. Governor Paul Laxalt sent a commendation charter member of Republican Women of Henderson, which during the campaigns became known as Hal’s Gal’s. Tina majored in art at UCLA, which gave her a lifelong interest in the arts in all its forms. Tina moved to Henderson as a child when her father became an engineer for the Basic Magnesium Plant. Her mother was a Registrar at the Townsite School. Tina and her husband Hal, who served as an Assemblyman and State Senator in the Nevada Legislator, have resided in Henderson since 1952. They have three children, Vicky, Peter and Christy, eight grandchildren, and twenty-two great grandchildren.